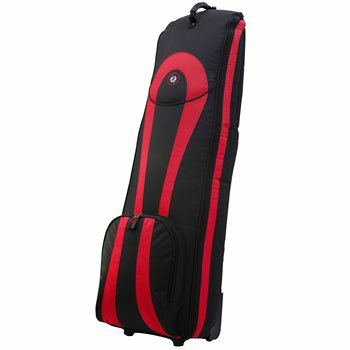 The Roadster 5.0 by Golf Travel Bags features strong 6-Denier Polyester blended material that provides durability, a padded top for club protection, a wrap around zipper opening for easy packing, an interior tie-down strap to secure the bag, a comfort grip rubber handle, a protective PVC bottom and durable rollerblade-style wheels for easy transporting. The bag is equipped with color accented zipper pulls and a large zippered shoe/accessory pocket. The Roadster 5.0 travel bag hold bags up to 10” and comes with a two year limited warranty.